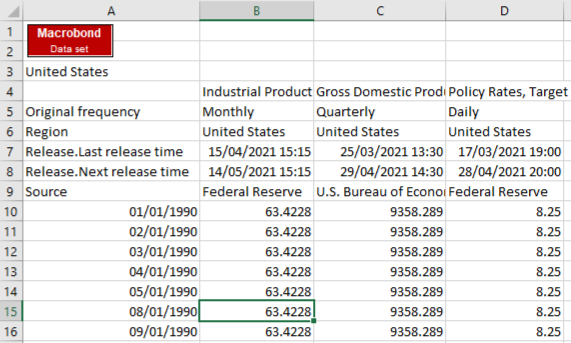 With the Macrobond Excel add-in (which works as Excel connector to Macrobond) you can import data from Macrobond into Microsoft Excel and easily keep it updated with the latest values. 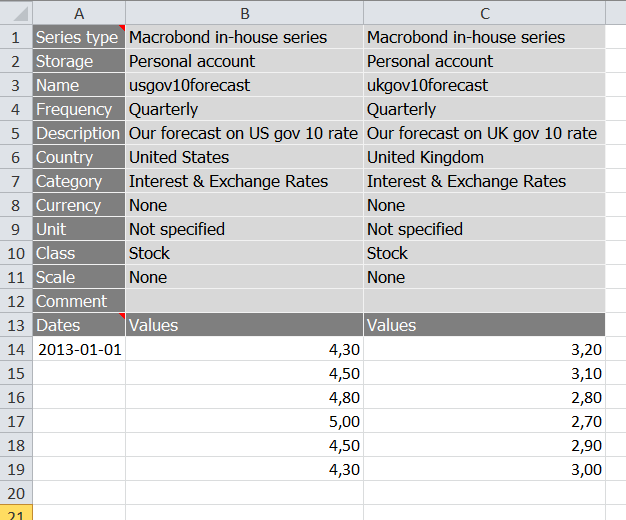 You can also create a custom series by uploading data from Excel and use as in-house series in Macrobond. Depending on your version of Excel, the add-in can look a bit different. As a Time series - this will import all the values of one or more time series that you select. As a Report - this will import the last value of predefined reports, such as company account data. There are three different methods that can be used for importing time series from Macrobond into Excel: selecting series by using the data navigator, use series from country and company overviews or use the result of a calculation in a Macrobond document. You then select one or more time series using the database navigator. Processed All series in the set are converted to the same frequency and calendar and there is only one column/row of dates. You may select rate of change calculations and scale for each series. Raw Series are treated separately and there is a column/row of dates for each series. Add one or more countries or companies by using the Database navigator. Then select the type of overview. 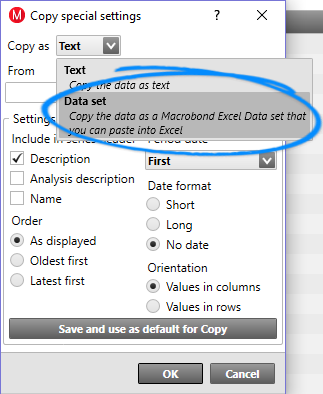 You can press the Import button/menu item in the Macrobond Excel add-in and select a saved Macrobond document. 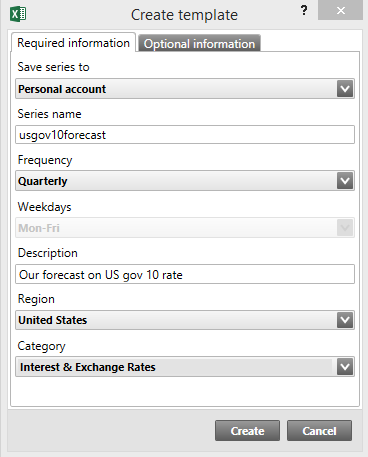 This will open a document tab in the Macrobond application where you can view and change the calculation settings. 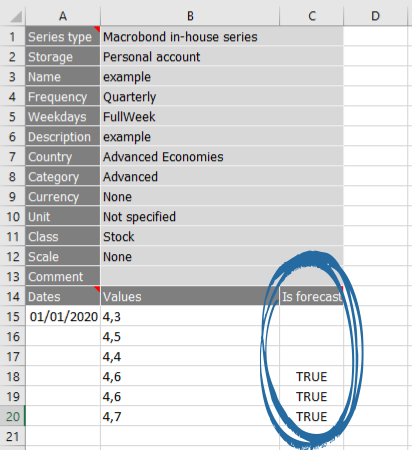 When you have imported data to the Excel sheet you will notice a red object in your sheet with the text “Macrobond Data set”. It is this object that keeps track of what series and settings you have selected. If you select the red Data set objet and press the “Edit selected data set” in the toolbar/menu, you will once again see the dialog where you select series and settings. When you press the Refresh button in the toolbar/menu, all data in the current workbook will be updated with the latest information. Data is always placed in the sheet relative the Data set object. If you move the Data set object, you will notice that the data is imported to a new position the next time you select Refresh. Please note that if you remove the Data set object, the information can no longer be updated when you select Refresh. You can have any number of Data sets in a workbook. Press the Report button in the toolbar/menu to bring up the report selection dialog. When you select an entity, such as a company or a country, for which there are reports, you will see a list of the reports at the top of the dialog. When you select a report then a new tab will be created on the right hand side. You can add more entities to each report by selecting the entity and then pressing “Add to active report”. Each new report will be imported to a new sheet. Additionally, in the Optional information tab, you can mark values of the in-house series as forecast, before uploading them to Macrobond. In order to do that, tick off the option Add a column that indicates if a value is a forecast. Please note that adding a forecast column is possible only while creating a template. In case you are modifying already existing template, this option is not active. In order to mark a the series values as forecasts you should use =TRUE formula in the cells. You can edit the template by selecting the “Edit template” button/menu item in the add-in. You need to fill in at least one date and one or more values. If only the first date is specified, the selected frequency will used to deduct the following dates. You use the “Upload all templates” button/menu item, which will look for templates on all the sheets in the workbook, or “Upload selected templates”, which will look for templates in the range of selected cells.